Team USA manager Marc DePerno has issued an open invitation to any American wheelchair user who has the interest and desire to explore wheelchair curling, to attend a summer training camp in Wisconsin June 2-5. The camp will be held at the Green Bay Curling Club, and will be directed by Team USA coaching staff. Wheelchair users may attend for one or more days, with the program building each day on what has previously been covered. With two members of the 2011 team retiring, there are opportunities for athletes with the desire to represent their country at a Paralympic sport, to discover what wheelchair curling is all about. Armstrong's fake Viagra saga ends without restitution to drug companies. At a hearing before US Fedral Judge Ricardo Martinez in Seattle WA Tuesday, Jim Armstrong and his son Gregory were not ordered to pay the $44,000 restitution requested by the manufacturers of Viagra and Ciallis pills, fake versions of which formed the basis of the Armstrong's convictions last February. Defense lawyers argued that restitution was not appropriate as the fake pills had been seized from Jim Armstrong before they could be smuggled into Canada and sold by Gregory in Vancouver nightclubs. Jim has said in interviews that he has a full explanation for his actions, but has not yet felt able to present it, in part out of concern for the welfare of his son, who is in an American prison serving a 12 month sentence. The competition calendar is becoming increasingly congested especially in October and November, and event organisers are beginning to make an effort to coordinate schedules to encourage travelling teams to attend more than one event. Several events last year were over-subscribed which is a great tribute to the organising committees, but a warning that wheelchair curlers must start to make plans further in advance. There is a list of competition dates on the calendar page which will be updated as information becomes available. Looking at last season is often a good indication of what may take place next season. Today the Norwegian Open and the Kinross spiel were added to October dates. If you know of an event that is not listed, please email me with the details. Just a reminder that comments posted anonymously, as noted at the top of the comments box, automatically disappear. Anonymous complaints about anonymous posts disappearing, suffer the same fate. Thomas Matheson, a varsity curler with the Laurentian Voyageurs, was asked by TC coach Wendy Morgan to work with Sudbury's rookie wheelchair curling team, an effort that earned them second place in the Northern Ontario provincials. 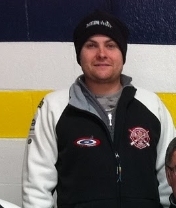 Thomas, in a report by the Laurentian University's Department of Athletics, talks about being given the opportunity to coach, the progress of his team and sharing that feeling of deflation at coming up short in the provincial final. The 3rd Annual Tunnock Trophy sponsored by cookie maker Tunnock's of Uddingston, was hosted by the South Lanarkshire WCC at the Lanarkshire Ice Rink in Hamilton last week. A full complement of twelve teams including one from England meant that applications were turned down from teams from Germany and Denmark. Aileen Neilson's Braehead rink, last month's Scottish Champions, took the Trophy with Jim Sellar's local rink finishing second. 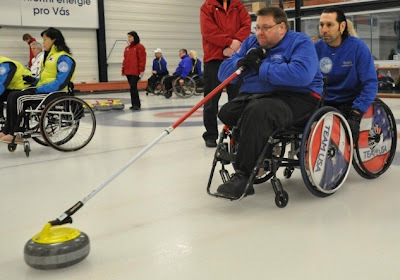 GB's Head Coach for Wheelchair Curling on his way April 16th. Alberta's Tony Zummack has finally received all the paperwork necessary for him to take up residence in Scotland as Great Britains Head Coach - Wheelchair Curling. He will be leaving on April 16th and staying in the Stirling area. His wife will join him in July and his daughter hopes to be accepted into Stirling University. A lengthy delay in processing the paperwork for his change of residence meant that he was unable to take over the Scottish team in time for the 2011 World Championships in Prague. He was able to meet many of the players at the recent Scottish Championships, won by Aileen Neilson's rink, present skip of the National Team. Curlers interested in being considered for the British national team training program have been asked to submit applications, and the next 8 member national squad, which presently includes the five who won silver in Prague, plus Rosemary Lenton, Jim Gault and Jim Sellars, will be selected from those applicants based in part on performances at the regular on-ice training sessions Zummack intends to hold at least once a week in Stirling and at other venues if available. Zummack will be Team Scotland's coach for the Worlds, and Team Great Britain's coach for the Paralympics in Sochi in 2014. Though only Scots have made the British team, Zummack says he will ensure that all Britain's wheelchair curlers have access to an opportunity to demonstrate their ability. "Giving as many wheelchair curlers as possible the opportunity to learn and improve will create long term growth in the entire program," he told me. 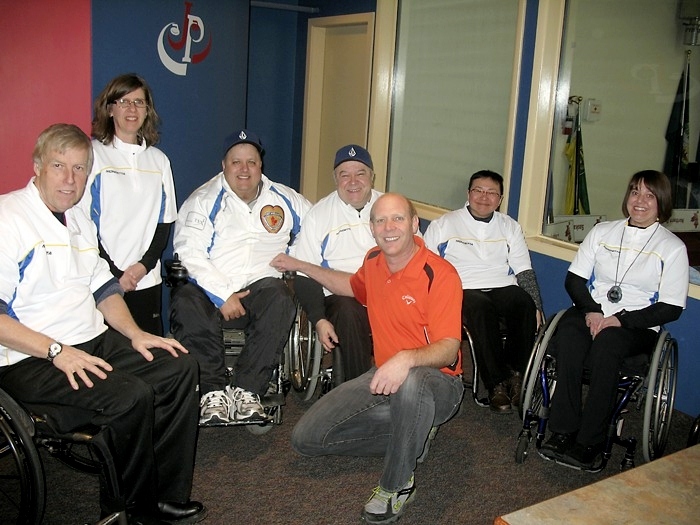 Jim Oastler reports that his Melbourne based Southern Cross Rollers were the first Australian wheelchair curling team to enter a state curling competition. They competed in the Victorian Curling Association summer league, finishing 4th out of 12 teams; a great result over able-bodied opposition that they hope to build on as they approach their winter league play leading up to the 2011 Australian Nationals. 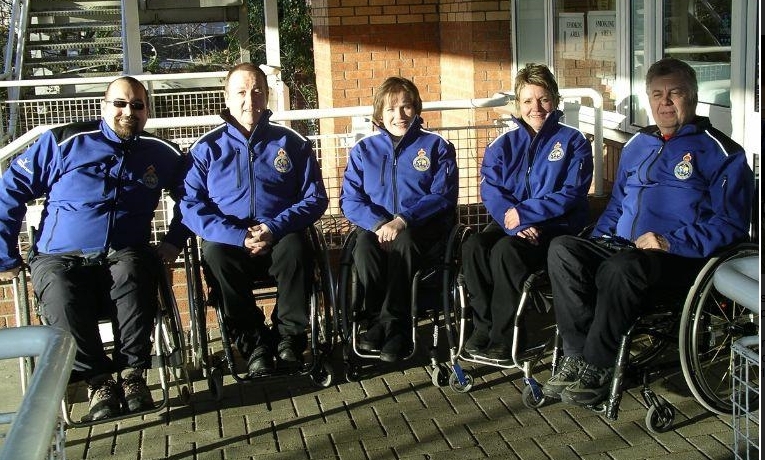 If the team continues its current progress they hope to be able to compete in the World Wheelchair Qualification round in 2012. The team relies on and thanks the Victorian Curling Association, Disabled Wintersports Australia, and Disabled Sport and Recreation for their on going support. Skatetown in Roseville, just up the freeway from Sacramento California, is offering ice for curlers starting Monday April 4. There will be four weekly clinics in April followed by curling drop-in nights on Mondays from May through July, run in conjunction with Wine Country Curling of Vacaville. This is the venue used for sled hockey so wheelchair access should be good. Read the story by Kayla Nix of the Roseville Press Tribune. Registration: Online at www.skatetown.biz or in person. Information: Susan Sweetser at (916) 783-8550, ext. 115. I would like to express my thanks to Dan Janidlo, Johanne Poulin and Patrick McDonald who have all very generously shown their appreciation for the work involved in publishing this blog and website by making a recent donation. Jim Pierce has also announced retirement from Team USA after the disappointments at the 2011 World Championships in Prague. telling his teammates he is giving up the sport. Jim was a founding member of the USA wheelchair curling team, playing in 66 games including five Worlds and two Paralympics, and finishing with a 2008 Worlds bronze medal and a 31-35 record. Patrick McDonald, who missed almost all of last season with a shoulder injury, aims to step up and take more responsibility next season, assuming he regains competitive fitness. "The shoulder is coming along ahead of schedule. I'm feeling really happy about having a complete shoulder replacement. From what the doctor's told me after my MRI it was most likely broken in Vancouver at the Paralympics," he told me. "I'm moving my family to Madison, WI. so I can curl full time and work with the coaching staff. I will also be helping find new athlete's to make the sport grow here in the States." Perhaps he will be able to infleunce the wheelchair users curling out of Duluth MN who have so far stubbornly resisted approaches from Team USA coaches because they want the WCF rules of play rewritten to allow them to deliver while their chairs are moving forward. The World Curling Federation has included a Learn to Coach Wheelchair Curling course on July 2nd in Füssen, Germany as part of its summer camp series. The course will be led by Sheila Swan, who was in charge of Team Scotland when they won their silver medal at the 2011 Worlds in Prague. Cost of the 4 hour course is 30 euros and will include coverage of the sports background, rules, safety, communication, assessment, equipment, delivery techniques, buddy-system, access to and exit from ice, movement on ice, warm-up routines, discussion, a DVD and a on-ice practical session. More information can be found on the WCF website. The 2nd Annual Cape Cod Summerspiel will take place July 17 - 20 in East Falmouth MA. Last year six teams entered, including players from USA, Canada and Germany. 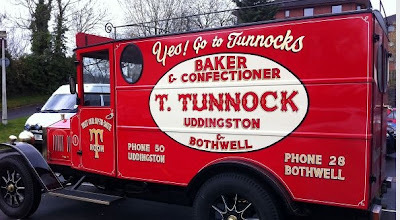 This year Russia and Scotland have already signed up. You can find information and entry forms HERE and teams are asked to enter by May 1st to allow the club time to guage demand for accommodation and transport.